If you are looking to replace your dirt, concrete or asphalt driveway or patio, paving stones are today's answer. Hardscapes by Neal Ragan Construction in Johnson City, Tennessee, Kingsport, Tennessee, Bristol Tennessee serving the whole Tri-Cities area is committed to bringing you quality products. 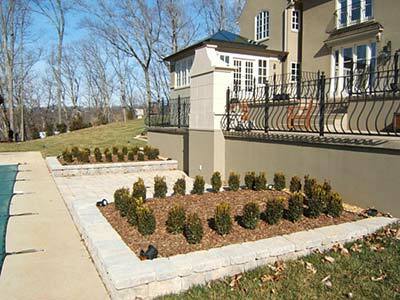 Neal Ragan Construction provides professional design, installation and maintenance for all phases of hardscapes, Paving Stones, Retainer Walls & Landscape Lighting with offices located in Damascus, Virginia & Abingdon, Virginia. You can reach us by calling 276-608-9626 or 276-676-3979. Neal Ragan Construction is at the forefront of paving stone installation. We enjoy what we do, are constantly striving for excellence and warranty our work from the ground up. Neal Ragan Construction will continue to be a dynamic leader in an expanding industry in providing hardscapes, landscape lighting, paving stones and retainer walls in the market place. Most people do not realize that paving stones are several times stronger than concrete. Concrete is hard and "brittle" and thus prone to cracking. Concrete cannot be repaired without leaving "scar" marks. Whereas concrete is tested to withstand 2000 PSI, paving stones are tested in excess of 8,000 PSI. Paving Stones are set in a friction base sand mixture, thus they do not move around at all, but remain flexible. This flexibility means that with cold and hot weather the expansion and contraction do not in any way create and ill effect on the paving stone installation. Paving stones are even earthquake resistant. Paving stones can be easily replaced should the need ever arise. Most importantly paving stones add beauty and aesthetics to your environment and value to your home. There are so many different types of paving stones, colors, textures, shapes, sizes, patterns and designs that they can blend in and greatly enhance the beauty of any home or building.